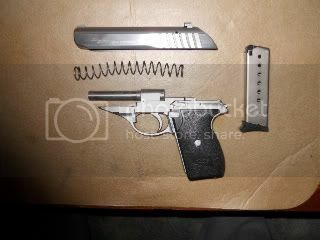 I have been looking into getting my better half a small pistol to learn to shoot on, and keep in the night stand/purse. I really like the looks of the walther pk380 and i think they come in fashionable colors which may entice her to want to learn how to shoot. But what it really comes down to for my mental health, is which one is going to stop a potential threat more effectively for a woman. I have family members and friends who wife's carry .380 and seem to like the caliber, but i thought it might make an interesting discussion here. So...fire away with suggestions. I like my Ruger LCP. Very light and concealable and not too hard to hit what I'm aiming at. Check out SIG, Glock, Springfield Armory. 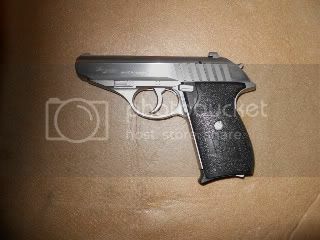 But if you have your heart set on .380 take a look at the SIG 232 or 232SL. Soild pistol. I'm not a big fan of the European style mag release that is at the heel of the grip. It just takes getting used to. I had one of those Sigs years ago and never bonded with it. While more comfortable than the PPK, I thought is had a lot of recoil for a .380. If possible, have her try as many pistols as possible and see what she's most comfortable with. thanks for the responses, gonna try and get her out to the range this weekend to shoot the 2 9's i have and see how she does with them and go from there...this will be her first time out, gonna try and get her to shoot the 5.56 and 7.62 also lolol, this should be interesting. I can't argue with that unless she really hates shooting it. Those little fuckers bite, but I love them as carry guns (specifically the S&W 642). Not only do they bite, but they take a lot of practice as well. Reflexred wrote: I have been looking into getting my better half a small pistol to learn to shoot on, and keep in the night stand/purse. I really like the looks of the walther pk380 and i think they come in fashionable colors which may entice her to want to learn how to shoot. But what it really comes down to for my mental health, is which one is going to stop a potential threat more effectively for a woman. I have family members and friends who wife's carry .380 and seem to like the caliber, but i thought it might make an interesting discussion here. So...fire away with suggestions. Oddly enough though the REAL reason to pick the nine is that out of comparable gun it's going to be a "softer" shooter. Most .380s are straight blowback, and have higher perceived recoil. If you have testosterone or want people to think you do, then you don't care. Most women aren't out to prove how tough they are, and would prefer something a little more comfortable to shoot. Also most women can get away with always carrying a purse or "bag" of some sort, so they can conceal a bigger pistol easier, even in heels and a skirt. More powerful--while no real combat handgun is "powerful", the 9mm pushes a heavier bullet faster, and that means it has the inertia penetrate deeper (though clothing and fat) to get to the organs and let the blood out. Wider options for bullets--from ball through various expanding designs to shot shells (though I don't know if there's a legitimate use case for the latter). Wider availability of ammo. Since militaries and the popo use 9mm a lot there is always some to be had. .380 isn't as common. Doesn't use a "military" caliber, so it can be used in more places. Reflexred wrote: thanks for the responses, gonna try and get her out to the range this weekend to shoot the 2 9's i have and see how she does with them and go from there...this will be her first time out, gonna try and get her to shoot the 5.56 and 7.62 also lolol, this should be interesting. Best thing to do is to take her to a commercial range and shoot a variety of pistols until she finds one she is comfortable with and thinks she will carry. A .22 in her hands is better than a 10mm in the safe at home. If nothing else the police can follow the blood trail. BillyOblivion wrote: Oddly enough though the REAL reason to pick the nine is that out of comparable gun it's going to be a "softer" shooter. Most .380s are straight blowback, and have higher perceived recoil. If you have testosterone or want people to think you do, then you don't care. Most women aren't out to prove how tough they are, and would prefer something a little more comfortable to shoot. I've found that adding the pinky extension to the mag on my LCP makes it at least tolerable. It is hard to shoot without it. 3. If it's for your girl she won't find an easer slide to rack than the pk380. 5. Ammo for a .380 is not hard to find anymore and there's a selection of SD rounds. 6. The PK389 is totally differnt than the ppk line. The PK is a cross between the p22 and p99 it's bigger than some 9s I own but it's the smallest pistol that let's me get a good full grip. Does she know proper grip and stance ? If she's smaller or lacks exp I'd go with the pk380 if she's not a small woman and or is comfortable around guns get the 9. My girl will not shoot my 9 or even my 5.7 but she loves the pk380 caus she can function it fully. So I don't need to go rack it for her. relatively inexpensive, reliable, effective - +p ammo works fine, and very easy to conceal. Aftermarket parts up the wazoo available.